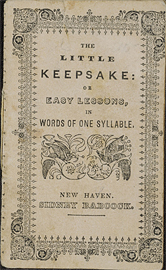 The Little keepsake, or, Easy lessons, in words of one syllable. Contents: Blowing bubbles -- The bad girl -- A game at ball -- The ride -- The swing. First sentence: "Ah, this is rare sport." Sidney Babcock published in New Haven under his own name from 1826 to 1884. Includes publisher's advertisement, p.  of wrapper. Copy in McGill Library's Rare Books and Special Collections:6 wood engravings by Alexander Anderson. Decorated wrappers. I. Mackenzie. Montreal. May/66. $10.00. H.M. Burstein & Co. Waltham, Mass. - '94 - $40.00; Hobbyhorse Books. Ho Ho Kus, N.J. - '97 - $100.00. Given to McGill 2001.
text.chapbook.black and white, 95 mm. Children's accidents -- Juvenile fiction. African American children -- Juvenile fiction.